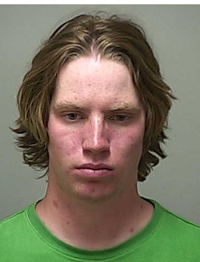 A 26-year-old Ketchum man faces a felony DUI charge after being arrested by Ketchum police for allegedly driving erratically early Sunday evening on Warm Springs Road. William R. Falcone was formally charged with the crime at an initial court appearance Monday in Blaine County Magistrate Court. Falcone was released later after posting $1,500 bond. A preliminary hearing was scheduled for April 29 before Magistrate Judge Daniel Dolan. Falcone is represented by Hailey attorney Douglas Nelson. Ketchum Police Chief Steve Harkins said the arrest occurred shortly after 6 p.m. He said that Falcone was pulled over by an officer for failing to maintain his lane of traffic on Warm Springs Road near its intersection with Wanderers Way. Harkins said Falcone was arrested on a felony charge because of two prior misdemeanor DUI convictions within the past 10 years. Falcone was also charged with the misdemeanor crime of driving with an open container of alcohol.